Whey is a byproduct formed during the making of cheese. Once thought of as a waste product, whey is today recognized as one of the highest quality sources of protein on the planet. In fact, it features the highest biological value of any protein, meaning it is digested and absorbed more efficiently than other proteins. Check with your doctor before trying whey protein supplements. You'll find two main types of whey protein at any fitness store. Whey protein concentrate is the more affordable option, although it does not contain as high a protein concentration as compared with the other type of whey supplement, whey protein isolate. WPI formulas are processed further than WPC formulas to remove most of the fat and lactose. This yields a higher concentration of protein and increased rate of absorption once consumed. Both types are considered fast-absorbing proteins, although WPI is a purer and better-absorbed form of whey protein. Whey protein begins the digestion process in your stomach and continues through the small intestine. The entire digestion process is fast. According to Helen Kollias, Ph.D., an expert in muscle development, whey protein navigates your gastrointestinal tract within a matter of 1.5 hours. However, the digestion process can take longer if you consume whey protein with milk or casein. These other proteins cause the whey to coagulate, which allows it to stay in your stomach longer. This is an effective strategy for a more gradual release of amino acids into your body. Professor Deborah Spurlock, Department of Chemistry, Indiana University Southeast, reports casein digestion takes about seven hours. Since the digestion process of whey is fast compared to other proteins like casein or meat proteins, it's important for your body to absorb the amino acids fast as well. Amino acids are the building blocks of protein, and whey contains all of the essential amino acids your body needs, making it a complete protein. 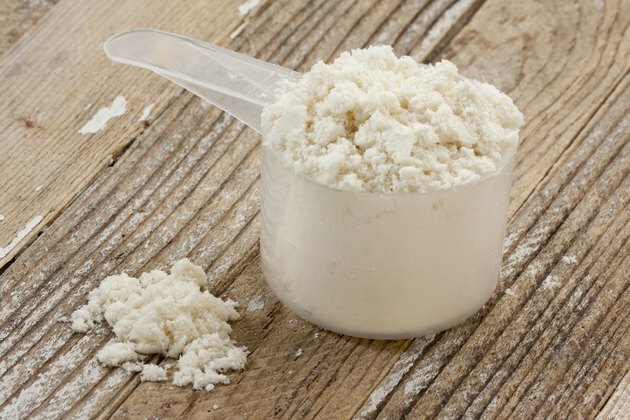 Whey is absorbed at a rate of about 8 grams to 10 grams per hour, according to Kollias. This is a much higher rate compared to casein protein, which may absorb at a rate of less than 5 grams per hour. Based on the research of Dr. Kollias, 15 grams of whey protein per serving is the ideal amount to consume. It maximizes the amount of the whey your body can digest and absorb in a 1.5 hour period. However, this doesn't factor in protein used by the body for energy or proteins simply not absorbed by your body. So, 20 grams to 25 grams of whey protein following each workout may be optimal. This is according to the University of Illinois McKinley Health Center, which also states that athletes in training may benefit from up to 50 grams of whey protein per day. Consult your doctor to determine how much whey is right for you.